The 356 was introduced in 1999 when Carver re-designed many features of the former 355 model. The aft deck house is more substantial and much better sealed from weather and pesky mosquitos. Structurally integrated windows, and elegant new portlights give a fresher and newer look. By redesigning the galley layout, Carver created an even more open concept layout and a better view into the salon. The new V-Berth design has a larger berth and more storage than previous models. The neutral colour Ultraleather and beautiful cherry wood finishes are all in excellent condition! 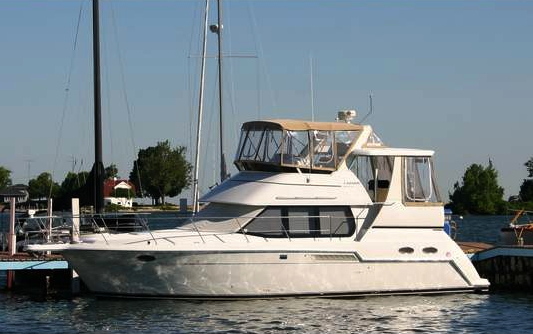 This two owner boat is located in Southern Georgian Bay and has only 450 hours. Located off-site … please call to arrange a viewing appointment.